For 2018, the standard deduction is $12,000 for singles, $18,000 for heads of households, and $24,000 for married couples filing jointly. Your total itemized deductions must exceed the applicable standard deduction for you to enjoy a tax benefit from donating artwork. Finally, please note that, if you own both the work of art and the copyright to the work, you must assign the copyright to the charity to qualify for a charitable deduction. 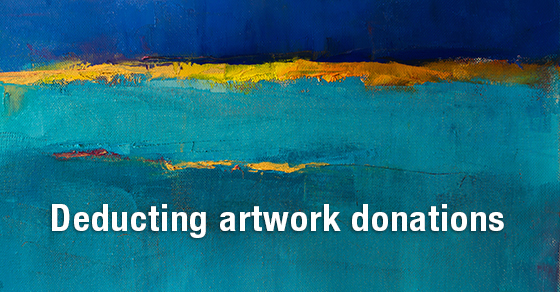 Donating artwork is a great way to share enjoyment of the work with others. But to reap the maximum tax benefit as well, you must plan your gift carefully and follow all of the applicable rules. Contact us to learn more.